Multizyme is a digestive formula containing digestive enzymes and herbs such as peppermint and ginger to help in breaking down carbohydrates, fats, and proteins. Digestive enzymes present in it help in different phases of digestion. The blend amylase, lipase, protease & cellulase ginger rhizome provides a choleric effect to increase bile secretion, helps in getting relief from chronic indigestion, the sensation of fullness and flatulence. The pancreatic function is supported by the pancreatic enzyme. Peppermint Leaf is a Carminative that enables release of entrapped air. Other ingredients found in Multizyme are defatted almonds, stearic acid (vegetable source) and, bromelain. 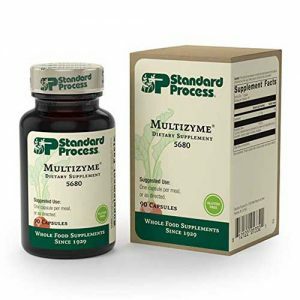 Multizyme is manufactured by Standard Process. It has been known as one of the top leading company for manufacturing natural supplements since 1929. They apply such strategies in manufacturing whole food nutrient solution which transform lives. Their founder is Dr. Royal Lee is the has dedicated himself to provide the best supplement. Most of the ingredients supplied to them are grown on certified farms with well-maintained fields. Then further processes include chopping, dicing, juicing, drying and animal tissue extracts for use in their products. The goal of Standard Process is to such nutrients to the body that are found in nature, harmless to our bodies and supports the body’s wellness. For advice and additional information about this supplement or helpful tips, you can contact the manufacturing company directly at the following phone number: 1-800-558-8740. Ingredients: Proprietary Blend: Fig (fruit), defatted almonds, pancreatin (3x), stearic acid (vegetable source), bromelain, amylase, papain, cellulase, and lipase. Other ingredients: Gelatin, lactose (milk), cellulose, water, and calcium stearate. Multizyme aids in digesting food. It contains digestive enzymes for such weak pancreas which cannot release enough enzymes into the gut to digest food. It improves nutrition, absorption, and utilization. It contains a blend of vital ingredients which are the reason behind its immense benefits. Multizym aids in relieving constipation, the high concentration of fiber present in fig helps to promote healthy, regular bowel function and prevents constipation. It reduces blood pressure and lowers cholesterol level and maintains the blood sugar level as well. It also lessens hunger and helps in losing weight as well. It is also used to treat digestion problems such as bloating. When your digestion gets better it also improves other function in your body it makes your heart healthy in which betaine safeguards heart health is by reducing levels of amino acids in the bloodstream, it helps by converting homocysteine to cystathionine, which is a harmless amino acid. It provides more energy to your body by breaking down starch present in your food. Cellulase present in it breaks down into usable glucose and it also breaks other harmful microbial biofilms. Multizyme also helps in breaking down fatty acid and prevent against irritable bowel syndrome. How Much Does Multizyme Cost? Multizyme is a little less expensive than other similar nutritional supplements. Side effects caused by multizyme for few individuals can be Diarrhea, abdominal pain and nausea. Many people using this supplement don’t undergo serious side effects but in the worst case tell your doctor immediately if you have any serious side effects such as severe abdominal discomfort, painful urination, and joint pain. Before using this product tell your doctor about your medical history including your past surgeries, medications, prescription drugs, nonprescription drugs or herbal medicines. For pregnant and breastfeeding women, it is mandatory to consult their doctor but to stay on the safe side use it only when it is needed else avoid using it. Multizyme can be ordered online from different places but our recommendation is to either buy it directly from the manufacturer or purchase it from trusted online retailers which may offer you discounts. We did a research on other products from Standard Process. Here is a complete list.